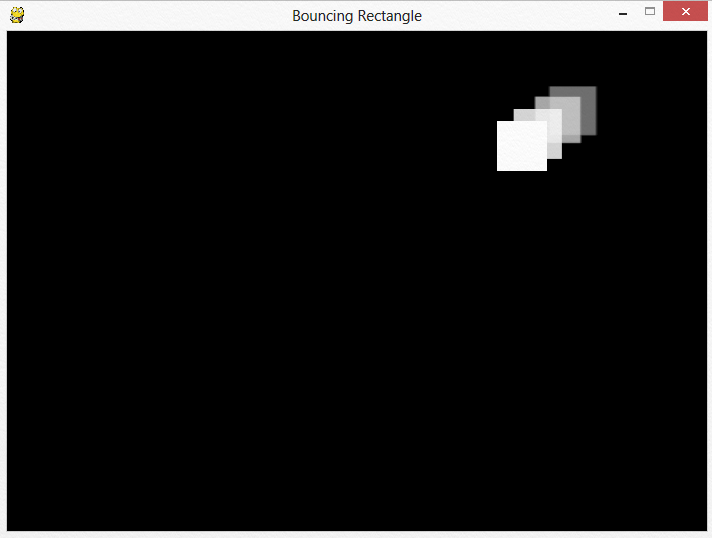 We will put together a program to bounce a white rectangle around a screen with a black background. Feel free to pick your own colors, just make sure the background color is different than the rectangle color! First step, start with the base template and flip the background color from white to black. This code should be around line 46. 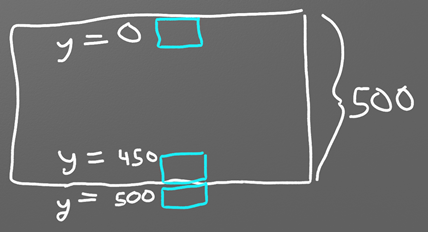 Next up, draw the rectangle we plan to animate. A simple rectangle will suffice. This code should be placed after clearing the screen, and before flipping it. Each time through the loop the rectangle will be drawn at an (x,y) location of exactly (50,50). This is controlled by the first two 50s in the list. Until those numbers change, the square will not move. The rectangle will be 50 pixels wide and 50 pixels tall. The dimensions are controlled by the last two numbers in the list. We could also call this rectangle a square, since it has the same width and height. I'll stick with calling it a rectangle because all squares are also rectangles, and depending on the monitor and resolution used, pixels aren't always square. Look up Pixel Aspect Ratio if you are really interested in this subject. The problem with the above code is that rect_x is reset back to 50 each time through the loop. To fix this problem, move the initialization of rect_x up outside of the loop. This next section of code will successfully slide the rectangle to the right. # Note how this is outside the main while loop. The direction and speed of the box's movement can be stored in a vector. This makes it easy for the direction and speed of a moving object to be changed. The next bit of code shows using variables to store the x and y change of (5, 5). Why check rect_y against 450? If the screen is 500 pixels high, then checking against 500 would be a logical first guess. But remember the rectangle is drawn starting from the top left corner of the rectangle. 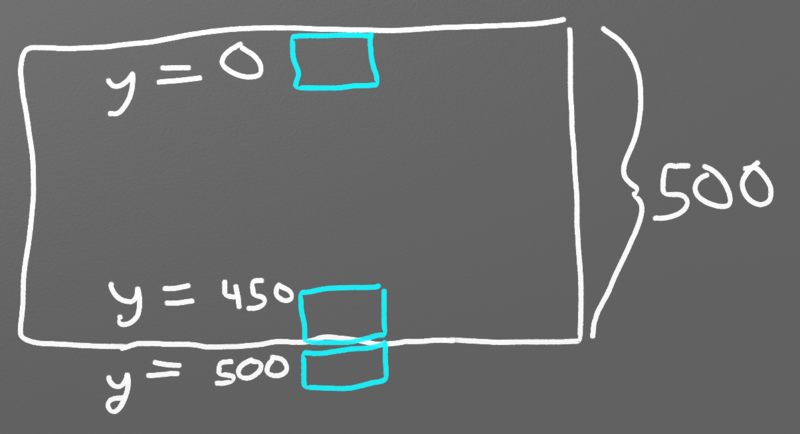 If the rectangle was drawn starting at 500, it would draw from 500 to 550, totally off screen before it bounced. See Figure 8.1. Interested in a more complex shape than a rectangle? Several drawing commands can be used based off the rect_x and rect_y. The code below draws a red rectangle inside the white rectangle. 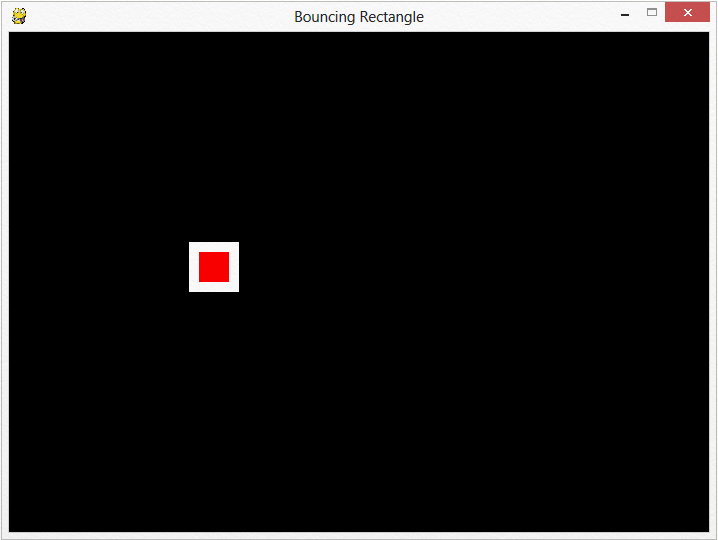 The red rectangle is offset 10 pixels in the x,y directions from the upper left corner of the white rectangle. It also is 20 pixels smaller in both dimensions, resulting in 10 pixels of white surrounding the red rectangle. See Figure 8.2. Animating only one item isn't enough? Need to animate more? How about being able to animate hundreds of objects at once? This shows how to use techniques from Section 8.1 to animate many snowflakes falling. It is possible to create x, y locations for things like stars, snow, or rain by using random numbers. The simplest way to attempt this is using a for loop to draw circles in random x, y positions. Try the following code inside of the main while loop. Try it, this program has an odd problem! Twenty times per second, each time through the loop, it draws the show in new random locations. Try adjusting the snow flake count and see how it changes the image. Obviously, we need to randomly position the snow flakes and keep them in the same spot. We don't want to generate new positions twenty times per second. We need to to keep a list of where they are. The program can use a python list to do this. This should be done before the main loop, otherwise the program will add 50 new snow flakes to the list every 1/20th of a second. Inside of the main while loop, a program may use a for loop to draw each of the items in the snow list. Remember, len(snow_list) will return the number of elements in the snow flake list. However, because we plan on modifying the snow flake's location we can't use this type of for loop because we'd be modifying the location of a copy of the snow flake's location rather than the actual snow flake's location. It is also possible to add things to the list and have different sizes, shapes, colors, speeds and directions for each item on the screen. This gets complex however because of the multiple types of data that need to be kept in the list. We will keep it simple for now, but once we learn about “classes” in Chapter 12 it will be easy to manage many different attributes for multiple objects. Animating multiple objects using a list. This example shows each snowflake moving the same direction. What if each item needs to be animated separately, with its own direction? If you need this for your game, see Chapter 12 on how to use classes. Lab 8 steps you through how to have hundreds of different items animated, each with their own direction. Extending from a 2D environment into a 3D environment complete with game physics isn't as hard as it would seem. While it is beyond the scope of this class, it is worth while to see how it is done. There is a freely available 3D program called Blender which has a “game engine” that allows programmers to create 3D games. The 3D objects in the game can have Python code attached to them that controls their actions in the game. Look at Figure 8.3. 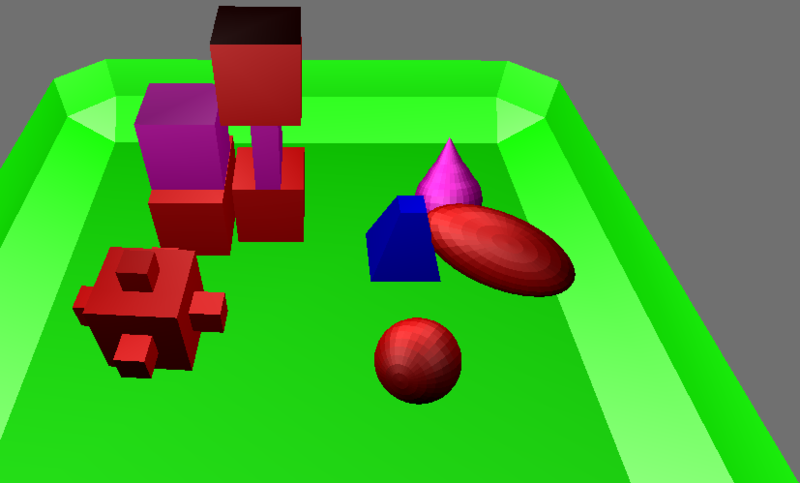 This shows a green tray with several objects in it. The blue object is controlled by a Python script that moves it around the tray bumping into the other objects. The script, shown below, has many of the same features that the 2D programs have. There is a main loop, there is a list for x,y locations, and there are variables controlling the vector. The main program loop is controlled by Blender. The python code shown in the listing is called by Blender for each “frame” the game renders. This is why the Python code does not show a main program loop. It does exist however. The blue object has a location held in x,y,z format. It can be accessed and changed by using the blue_object.position variable. Array position 0 holds x, position 1 holds y, and position 2 holds the z location. The if statements check to see if the blue object has reached the borders of the screen and the direction needs to reverse. Unlike pixels used in the 2D games, locations of objects may be a floating point number type. To position an item between 5 and 6, setting its location to 5.5 is permissable. # associated with the blue object. # Check to see of the object has gone to the edge. # If so reverse direction. Do so with all 4 edges.